Victorian health authorities are on a “search and destroy” mission after a rare fungal superbug, which has previously spread to more than a dozen countries, was found on the skin of a 70-year-old man. 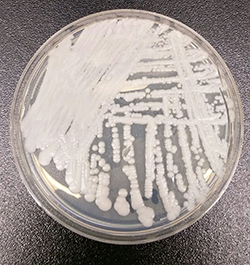 Candida auris was first discovered in 2009 in Japan and according to the Centres for Disease Control and Prevention in the United States, there has been one case reported in Australia. The bug survives on cooler skin and surfaces, which amplifies the risk of it spreading in hospital and between patients. It’s also resistant to the main medications used to treat similar bugs. Since the above booklet related to the fourth horseman was published, human beings are directly causing antimicrobial resistance. For example, because of overuse of antibiotics, many now realize that the USA and many other parts of the world are setting themselves up for the possibility of getting infections from bacteria that are resistant to various antibiotics (yet, the Europeans and their animals are not quite in the same situation). I have warned about this for some time, and even made a YouTube video about this: Are Americans & Asians setting themselves up for destruction from antibiotic use? A fourth of the earth–that is something in the neighborhood of 2,000,000,000 people–a huge amount. Since this horseman’s ride begins prior to the start of the Great Tribulation, it is likely that the USA and at least some of its Anglo-Saxon dominated allies would be affected–which are end time descendants of Israel, and also sometimes prophetically referred to as Israel (cf. Genesis 48; see also Anglo – America in Prophecy & the Lost Tribes of Israel). They will also be affected AFTER the start of the Great Tribulation. And the pestilence and famine within. Why should Ezekiel’s warning to ‘Israel’ include the USA and its Anglo-Saxon allies? Well in addition to prophecies in Genesis 48 & 49, consider that Ezekiel 7:2 points to problems in the “four corners of the land.” While some may point to the tiny nation called Israel, consider that the USA, UK, Canada, Australia, and New Zealand are spread around the corners of the earth. It is apparent, that like others in the past, the USA and at least some of its Anglo-Saxon allies will be weakened by pestilences before they are finally taken over (cf. Daniel 11:39; 8:24-25; see also USA in Prophecy: The Strongest Fortresses) by the final ‘revival’ of the old ‘Holy Roman Empire’ (watch also Europe and the ‘Holy Roman Empire’). Super malaria is only a prelude to what is coming.